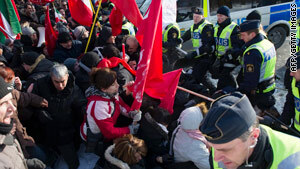 Protesters clashed with Swedish police outside the Iranian embassy in Stockholm earlier this year. (CNN) -- Protesters in the capital cities of Denmark and Sweden attacked Iran's embassies Thursday as demonstrators opposed to executions turned violent. In Copenhagen, Denmark, about 100 people attacked the embassy and police with stones, Copenhagen police spokesman Mads Firlings said. The police initially responded with pepper spray and then called in reinforcements, including police dogs, he said. Four demonstrators were arrested, and one officer was lightly wounded, he said. An organizer said that as many as 300 people had gathered outside the embassy to protest the Iranian government's recent execution of five political prisoners. The demonstrations began peacefully but turned violent when a representative of the Iranian Embassy "provoked the demonstrators" with "very bad words in Persian," said Hilsen Mahmoud, the demonstration organizer and a member of the group Free Iran Society. In response, the demonstrators attacked the embassy, he said. In Stockholm, Sweden, demonstrators at the Iranian Embassy pelted the building with rocks and Molotov cocktails, police said. No one was hurt, said Carina Andersson, a city police spokeswoman. Five people were arrested, and four windows were shattered in the melee, she said. Protesters had permission to stage a demonstration between 3 and 6 p.m., she said. The event was devoted to opposing the death penalty after the executions in Iran. Although 50 people had been expected, many more showed up, she said. The demonstration turned violent when about 100 people tried to storm and pelt the embassy, according to Andersson. Police blocked the protesters from entering the building. The protest was "in defense of the Iranian people," according to the application the organizers submitted for the permission to protest, Andersson said. CNN Swedish affiliate TV4 reported that an organization called the International Committee Against the Death Penalty was behind the protest. "We are protesting against the death penalty and for the fight in Iran against executions," Mamad Amiri, who represents the organization, told Sweden's TT wire service. "We condemn the regime that had five political activists executed this Sunday." Another demonstration is scheduled to take place Friday. Five people were hanged Sunday inside Tehran's Evin Prison for "anti-revolutionary" activities, Iran state media said. One was executed for his connections to the 2008 bombing of a mosque in the southern city of Shiraz, the reports said. The other four had ties to the Party of Free Life of Kurdistan, a militant Kurdish nationalist group accused of carrying out attacks in Iran, the reports said.